India has retained its crown as the world’s fastest-growing large economy, according to government statistics. Growth of 7.9% in the first quarter of this year has seen it stay ahead of China – a country that’s become synonymous with rapid economic growth. According to official Chinese statistics, GDP there reached 6.7% in the first quarter. 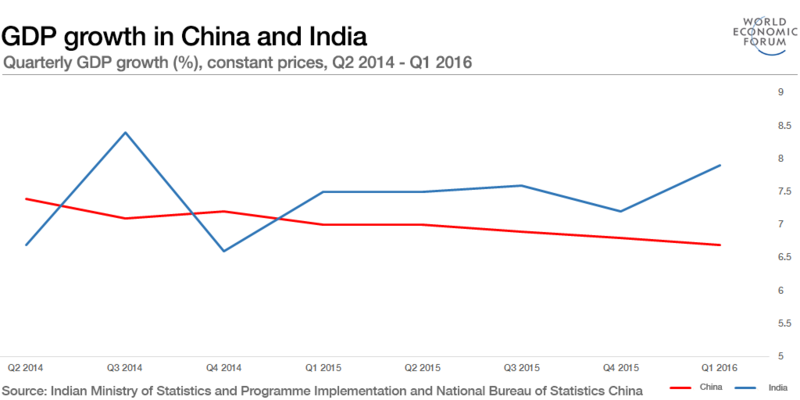 The above chart shows quarterly GDP growth, compared with the same quarter the previous year, based on official data from India and China. It is calculated using constant prices. As the chart highlights, India’s growth has exceeded China’s since the last quarter of 2014. It emphasizes both the slowdown in the Chinese economy and the emergence of India as a major force in the global economy. China’s economic slowdown has been well-documented. The economy is facing a number of challenges, including weak exports, high debt levels and slowing investment. This has had an impact on the global economy, with the IMF estimating significant effects of Chinese declines across Asia generally. However, it is hoped that an economic transition from infrastructure and investment to consumption and services will ensure stability. 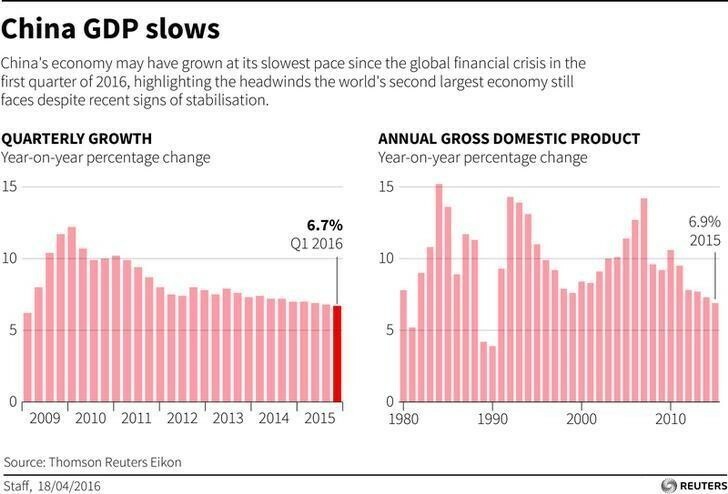 It is worth pointing out that China’s growth figures remain the envy of many of the world’s most developed economies. Across Europe, and in the United States, GDP growth remains much lower. For example, in 2015 across EU member nations, it was just 1.9%, according to Eurostat. India’s growth has been underpinned by agricultural development. Previously dependent on imports, it is now a net exporter of food. The corresponding improvements in health and well-being have seen significant demographic dividends, with the country expected soon to have the largest and youngest workforce the world has even known. India is now also home to globally recognized companies, from industries such as pharmaceuticals and steel to space technology. Private consumption and exports of goods and services have driven growth in the world’s second-largest country. However, significant problems remain across India, from inadequate infrastructure to a skills gap, as well as inequality and poverty. The GDP figures have also faced criticism, over a revised method used to calculate them.